I make some big claims for the power of competing truths to shape the reality of politics, climate change, economics and much else besides. But could competing truths help do what the US and other Western militaries seem unable to do: defeat and destroy Islamic State? Malcolm Nance is an American counter-terrorism expert, a former naval officer, spy and torture-resistance instructor who became famous in 2007 for writing that “waterboarding is torture… period.” He has now published a book, Defeating ISIS, in which he argues that we should be using ideology to fight ideology, recasting how the many Muslims who support and supply Islamic State (IS) see the organization. Nance argues that we can “disrupt the narrative” of Islamic State being “this oval of a nation state that has been carved out of” Iraq and Syria, by breaking those lines of communications. He reckons this could be done by parachuting in small insurgent forces to take over particular stretches of highway; then, when IS fighters are forced to come out of the towns to combat those insurgents, using aerial bombardment to obliterate them. IS would thus be revealed to control only a string of municipalities, not a broad territory. Having challenged the “State” part of Islamic State’s identity, Nance goes on to challenge the “Islamic” part. He sees IS not as radical Islamic extremists like Hezbollah, but as an Islamic cult. And he defines cultism as the “corruption of a mainstream religion for personal or political purposes”. He sets out numerous ways in which Islamic State doctrine departs from traditional Islam, including the practice of Takfir, the declaration that someone is an unbeliever and is no longer Muslim (with perilous consequences for that individual’s health). Nance argues that, through the “megaphone” of mainstream Islam, anti-IS forces should be broadcasting the message that “ISIS’s belief system endangers your soul” and that “having contact with them is like having contact with demons”. By challenging the Islamic credentials of IS, Nance believes, we can starve them of popular support and so undermine the foundations of their power. Given these further options, the susceptible jihadist or IS sympathiser might look at the West, with its generally liberal attitude to faith and religious practice, through a quite different lens. Both The Economist and Malcolm Nance also advocate likening Islamic State to an ancient Islamic sect, the Khawarij (meaning “the outsiders”), a group that assassinated a caliph and practised Takfir. According to Nance, members of Islamic State really hate being compared to the Khawarij – and that must be a good thing. Britain is a conservative place, they say, so when in doubt the electorate will tend to stick with the status quo. For the EU Referendum, the assumption has been that the Remain campaign has the advantage. We’re all too confused by claims and counter-claims about the pros and cons of Brexit, so in the end we’ll settle for what we know. Recognising this conservative bias, the Leave campaign is trying hard to reshape our definition of the status quo. Staying in the EU, they claim, is the riskier gamble, because the EU is changing so radically. The status quo is a free trade zone with cooperation between European states on security, the environment and other supra-national issues. We can have all that by leaving the EU, they promise. Leave = Status Quo. On the other hand, if we vote to stay in the EU we will be subjected to a process of ever greater political integration and ultimately we will find ourselves in a very different (and possibly unpleasant) place. Remain = Leap into the Dark. It is a bold campaign that seeks to redefine the status quo, but so far the Outers are doing a good job of it. The response from the Remain campaign should be: “Possibly. But if the EU status quo really does change that much, we can always vote to leave at a later stage.” We should be judging whether we want to be part of the EU as it is now, not as it might be in some version of the future. We buy more from the rest of the EU than the EU buys from us (think of all those BMWs and bottles of French wine), so the EU will want to maintain the same free trade relationship with us even if we leave. This makes complete sense. It suggests we hold the stronger negotiating position thanks to our EU imports. It’s an easily understood truth that is regularly deployed by Nigel Farage and other eurosceptics. The EU takes almost half of British exports, whereas Britain takes less than 10% of the EU’s. Now who has the power? The first truth refers to the absolute value of our imports and exports; but the more relevant truth, as far as a negotiation is concerned, is the relative importance of those imports and exports to each party. Bluntly, the EU is an awful lot bigger than the UK, and isn’t going to care nearly so much if trade breaks down. Of course, it’s in everyone’s interest to maintain free trade, but if other factors complicate EU calculations – such as our general awkwardness – then the EU is much better placed to walk away from the negotiating table than we are. Greece is voting today in a referendum about the Euro. Or maybe it’s a referendum about EU membership? Or…? Should the plan of agreement, which was submitted by the European Commission, the European Central Bank and the International Monetary Fund in the Eurogroup of 25.06.2015 and is comprised of two parts that constitute their unified proposal be accepted? This refers to a proposal from Greece’s major creditors that is no longer on the table. So, at face value, it’s a meaningless question. Yet the Greek government, the European Central Bank, the IMF and the world’s media all view it as immensely meaningful. The trouble is, they disagree about the meaning. The Italian Prime Minister, Matteo Renzi, said that Greeks will effectively be voting on whether to stay in the euro. Many European leaders would consider a No vote a fundamental rejection by Greece of the single currency, and perhaps even of the whole EU project. On the other hand, the Greek government claims the referendum is not about the euro, and seems to view it as a negotiating tactic to achieve better bailout terms. Interestingly, the Greek Prime Minister, Alexis Tsipras, has suggested he will resign if there is a Yes vote, implying that — among other things — the referendum is a vote of confidence in his catastrophic leadership. European Commission President Jean-Claude Juncker, who would like to see the back of Tsipras, is encouraging Greeks towards this interpretation. With such contrasting ideas of what the referendum is actually asking, it’s not surprising many Greeks have struggled to decide how they should vote. Pragmatists have given up trying to understand the question in favour of assessing the likely consequences of a Yes or No vote. 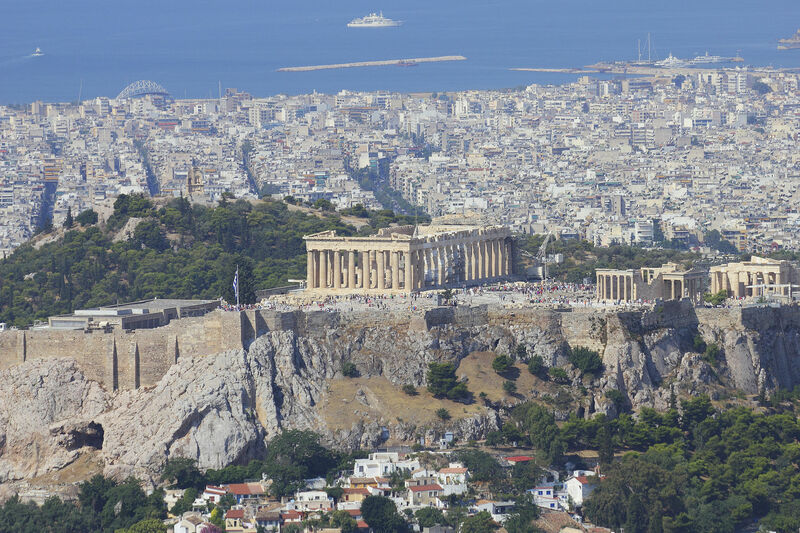 If Greece votes Yes, it’s very hard to predict what will happen. The ECB will have to make a fresh bailout proposal, which may or may not be accepted by the Greek government, which may or may not still be led by Tsipras and his Syriza party. The alternative scenario is perhaps clearer. If Greece votes No and Syriza stays in power, it’s almost impossible to imagine how the country will resolve its differences with its creditors before it runs out of money and has to start issuing IOUs, in the process creating a de facto new currency. By that interpretation, whatever the wording on the referendum paper, this looks like a pretty straightforward decision between keeping and renouncing the euro. Indeed, both Francois Hollande and Jean-Claude Juncker have warned that a No vote will mean Greece having to leave the euro. It will be a brave Greek voter who ticks the No box while remaining confident that their 2016 salary or pension will be coming to them in euros. Today we celebrate 800 years of Magna Carta. It carries great meaning for modern lawmakers: freedom from tyranny, fair trial, the rights of man. The ideals of liberty and justice symbolised by Magna Carta underpin the US Constitution and have informed human rights campaigners around the world. The historian Bishop Stubbs declared all English constitutional history to be “a commentary on Magna Carta”. Lord Denning called it “the foundation of the freedom of the individual against the arbitrary authority of the despot”. This conception of Magna Carta is an important reality for us – it is very real indeed. 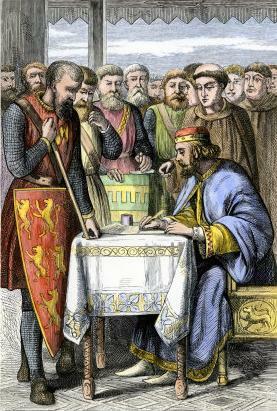 And yet it is not the original reality of Magna Carta, a document that was not called by that name, was not signed by King John (he used his seal), and which was repudiated by both monarch and barons after just a few weeks. A last-ditch peace treaty between two upper class factions, the “Charter of Runnymede” is unconcerned with the oppression of the common man, freedom of speech or democratic representation. Instead, it prioritises the interests of the Church and the (mostly French) aristocracy, focusing in the main on the specific grievances of rich landowners. It is harsh on Jews (“If anyone has taken a loan from Jews, great or small, and dies before the debt is paid, the debt is not to incur interest for as long as the heir is under age”) and women (“No man is to be arrested or imprisoned on account of a woman’s appeal for the death of anyone other than her own husband”). About a third of the 1215 Magna Carta was rewritten or cut within ten years, and almost every clause has since been repealed. It does seem odd that a failed agreement between one oppressor and a bunch of disgruntled lesser oppressors has come to represent the very essence of liberty and the rights of man. And yet it has. Its reality has been shaped — partly by John’s son, Henry III, and partly by 17th century Parliamentary spin doctors — into something powerful and very valuable. A kind of historical alchemy, one might say. To go back to the 1215 text and protest that it has quite a different meaning is to miss the point. Magna Carta IS freedom and justice. It doesn’t really matter what the words say. A curious story is emerging in the aftermath of the UK General Election that suggests polling organisations may unintentionally have shaped our reality to a remarkable degree. Consistently, in the weeks and months before the election, a wide range of polls put Labour and the Conservatives neck-and-neck. Politicians on both sides confidently expected their party to draw ahead, but as time passed and it didn’t happen even the most bullish started admitting the obvious — it was going to be a hung parliament and whoever wanted to hold power would have to do a deal with one or more of the smaller parties. When the Conservatives then won a comfortable majority, the polling failure was considered so serious that the British Polling Council launched an independent inquiry. Journalists and politicians across the land poured scorn on the pollsters. Many theories have been put forward to explain the failure — “shy Tories” reluctant to admit their allegiance, a last-minute swing driven by fear of the SNP, a poor turn-out by Labour supporters — but I am less interested in why it happened than what the consequences are. Because of the consistent story coming out of the polls, the party manifestos — launched only a few weeks before election day — were widely seen not as promises of policies to be implemented in the event of victory but opening negotiation positions for the inevitable coalition bargaining that would follow an inconclusive vote. We can reasonably presume that the parties themselves didn’t really expect to have to implement all of the contents of their manifestos. Indeed they may well have included, at the last minute, more extreme policies than they wanted, expecting to bargain them away. But then a surprise majority eliminates the need for negotiation, and suddenly the Tories are obliged to follow through on everything they’ve pledged. Did this happen? Did the polls influence the contents of the Conservative manifesto? Did David Cameron and George Osborne come up with excessively right wing policies so they would have something to give up in a new deal with the Liberal Democrats? One obvious point of contention is the £12 billion of welfare cuts the Tories want to find – but this policy was announced by Osborne in January when many Tories still expected a majority. More likely faux-policies are the crazy Right to Buy extension, the abolition of the Human Rights Act, the Inheritance Tax threshold increase, the 500 new free schools, the benefit cap reduction and the pledge not to increase personal taxes. Any one of these, one imagines, David Cameron might have been more than ready to give up in return for LibDem support. Now, with a parliamentary majority, he has to stand by them all. That will be our reality for the next five years, and there’s a good chance the pollsters — in honestly reflecting what they measured — have helped to shape it. The Conservatives have launched a campaign poster declaring “THE DEFICIT HALVED”. This is odd, as up until a few weeks ago they had been telling us they’d cut the deficit by a third. Then how did our honest leaders come up with the “deficit halved” claim? Easy. They just redefined the word “deficit”. To most of us, the deficit is a cash figure: the money the government has to borrow to pay for public spending not covered by taxes etc. It is the amount we add to our national debt each year. Now, magically, it means something different: “deficit” is apparently shorthand for “deficit as a percentage of GDP”. And as GDP has risen over the last five years (it could hardly have done otherwise), this convenient ratio has fallen faster than the actual cash value of the deficit. Tories will argue that the ratio is what matters in practice – the cash figure is meaningless unless you know how big is the economy that is incurring the resulting debt. But that doesn’t make their pre-election definition-fiddling any less sneaky. If you do the work, does it matter what you’re designated? Is a false memory a true memory? convicted Drivers in… on Is nicotine good for you?